Brass tip set screws are a headless screw that is threaded the entire length. It has a hexagonal drive at one end and a protruding brass tip or half-dog point at the other. One of the main advantages brass tip set screws have over cup point set screws is they won't cut into the shaft and damage it or the component. 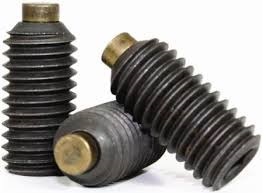 Where nylon tip set screws are used on unhardened shafts, brass tip set screws are used on hardened shafts and have a less chance of deformation and can also be reused many times. RC Fasteners & Components is your number one source for brass tip set screws in metric and inch sizes at factory-direct prices.